A 10 minute arms routine CAN make a difference! Every woman wants to be able to wear a tank top and show off her lean arms! That’s why I put together this routine to tone that upper body. To get the complete final look you strive for you have to make sure to work your biceps, triceps, shoulders and even back. Say goodbye to flabby arms and hello to definition! I have a tendency to focus on my lower body more than anything when I workout. I have always had sculpted legs but I realized my core was weak and I lacked upper body strength. In the past year I have made sure to do at least two arm workouts a week and add more yoga into my life. Both have made a huge difference! I am noticing muscle tone that I never saw before and even getting comments from other people now. It’s a great feeling and all it took was a few little repeat exercises with a pair of hand weights. This 10 minute arms routine requires a set of dumbbells. You can start with hand weights that are just a few pounds and work your way up. 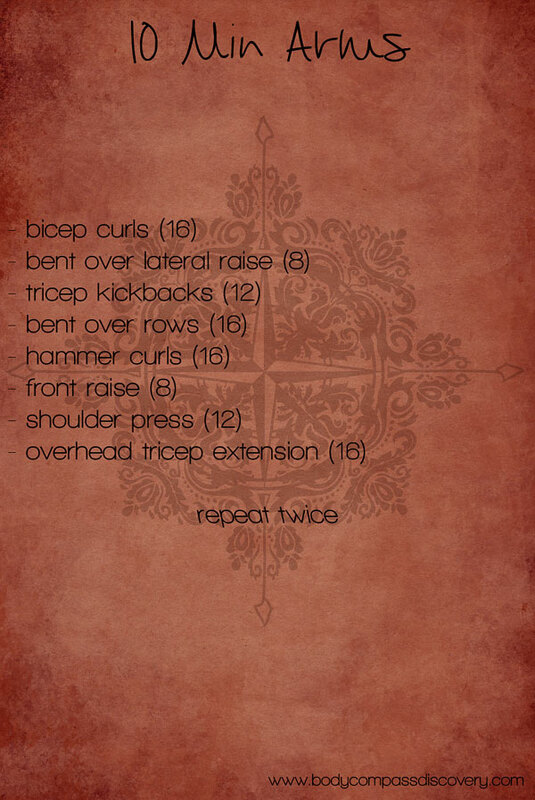 It consists of eight different moves to sculpt your arms and should be repeated twice if possible. If you need to start small, I first bought soft handheld weights. I mainly used these for walking and step routines, but they do help to get you used to dumbbells before you up your weights. Any set of dumbbells will work, but my recommendation is an adjustable one! This is what I personally use for my home gym. You can remove and add weight as needed. This 10 minute arms routine is not just for girls! A guy can easily do this circuit, and I encourage to maybe increase the amount of reps too. Get to lifting! P.s Found your post via the Blogging Boost facebook page.